Jet Fruit & Tea Smoothies pack real fruit puree, antioxidant-rich tea, and vitamin C. They are dairy-free, fat-free, and preservative-free! Jet is a famously simple pour over to keep your prep time to a minimum. A Green Tea Smoothie with Matcha! A light and refreshing Green Tea paired with our rich creamy vanilla. With a simple 1:1 mix, DaVinci gourmet smoothies are as easy to make as they are delicious! Just pour over ice and blend. Choose from exciting fruit and veggie flavors. 100% Natural, bursting with real fruit flavor, and oh-so-easy to prepare: just pour over ice & blend! Gluten free, dairy free, aseptic packaging for long shelf life! 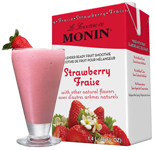 Made with real fruit and pure cane sugar, Monin Fruit Pur�es add delicious flavor to your cocktails, mocktails, and more. All Monin Purees are shelf stable for convenience. 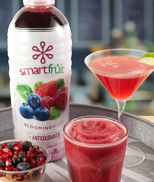 Smartfuit is an all-natural, non-GMO, 100% real fruit puree with no added sugar! Available in ten fabulous flavors. Easy to prepare as a smoothie, juice, or dessert enhancer! Shelf stable 48oz plastic bottles.